Click your Gmail account picture (upper right). A dialogue box opens telling you about your current account–the one you are monitoring email in at the moment. At the bottom left is a button that says, ‘Add account’. 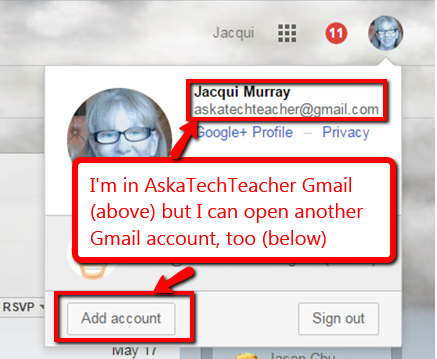 Add a link to any other Gmail account you have so you can click between them without having to log in/out. My approach works most of the time, but will unexpectedly and occasionally close the accounts without warning. I like Chris’ better.